Your commentary in the MPNforum has created quite a stir! Apparently some of our distinguished hematopathologists are concerned about the negative impact on performing bone marrow biopsies that your recent on-line editorial might induce. They have emailed me their concerns. By the way, it was very kind of you to quote my book, which was printed 40 years ago! We have made some improvements in diagnosis and bone marrow interpretation since. Incidentally, I hope you notice that William Damaschek wrote the introduction. No one ever implied that bone marrow biopsy is “diagnostic” in all cases. For example, some patients with CML with granulocytic hyperplasia may be difficult to distinguish from a morphologic standpoint from patients with a severe leukemoid reaction. This distinction is resolved by using cytogenetics or molecular genetics (BCR-ABL). In our experience, we believe that we can distinguish 90% of cases or more of patients with PM from those with ET. The bone marrow in polycythemia is not always distinguishable from ET but most often is, and we reported this in an abstract in Blood just this past year. (Prospective Evaluation of the World Health Organization Criteria for the Diagnosis of Polycythemia Vera, Authors include Richard T. Silver, William Chow, Stephen P Arles, Katherine Vandris, Ivy Tam, Anita Narayan, Maria T De Sancho, Attilio Orazi and Stanley J Goldsmith, ASH Annual Meeting & Exposition,San Diego,CA, December 10 – 13, 2011). Further, we demand a red blood cell mass for the diagnosis of PV and ET since we believe that the bone marrow is not always diagnostic in early cases. Further, the use of erythropoietin (EPO) levels is not satisfactory because in about 15% of cases of PV it is normal. (Data very similar among Silver, Spivak and Prchal). Notwithstanding the aforementioned, as clinicians we at Cornell believe every patient with an MPD should have a bone marrow biopsy at diagnosis. This allows for more adequate evaluation for fibrosis cellularity, etc. and establishes a baseline to evaluate subsequent response, evolution, etc. Most importantly it is necessary for the experienced clinician (hematologist) to review all his cases personally with an experienced hematopathologist. We are extremely fortunate to have here at Cornell, Professor Attilio Orazi, a world famous hematopathologist who along with Thiele is a leader in the field. As always, I send my best regards. * As you know, the first histopathologic criteria seemed “Bone marrow pathology in essential thrombocythemia: interobserver reliability and utility for identifying disease subtypes.” Blood. 2008;111(1):60-70). Subsequently, an overall “blinded” consensus ranged from 88% from 2 European centers (295 cases) (Thiele, J et al. “Essential thrombocythemia versus early primary myelofibrosis: a multicenter study to validate the WHO classification.” Blood. 2011;117(21):5710–8) to 93% from 7 international centers (1104 cases) (Barbui, T et al. “Survival and disease progression in essential thrombocythemia are significantly influenced by accurate morphologic diagnosis: an international study” J Clin Oncol. 2011;29(23):3179-84). 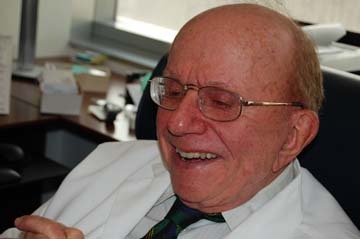 © Dr. Richard T. Silver and MPNforum.com, 2012. Unauthorized use and/or duplication of this material without express and written permission from this blog’s author and/or owner is strictly prohibited. Excerpts and links may be used, provided that full and clear credit is given to Dr. Richard T. Silver and MPNforum.com with appropriate and specific direction to the original content.